Run the F as an express train from Jay St./Borough Hall to Church Ave. The F would stop at York St., Jay St., 7th Avenue and Church Ave. before running local to Coney Island. Meanwhile, extend the V to Church Ave. as the local. Church Ave. is the last four-track stop on the Culver Line and provides for a switch so that the V can turn around and head back to Manhattan. With this plan, the stations with the highest number of riders would see staggered service. Carroll Gardens riders wouldn’t have to shove Park Slope residents into already-crammed trains in the morning. 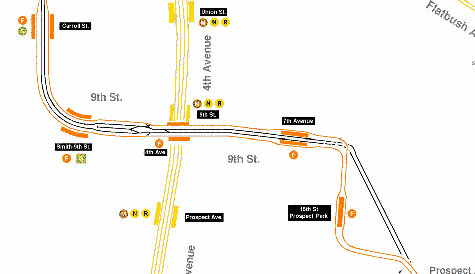 The V would become a more viable line in Manhattan, and everyone in Brooklyn would be happy. sing the petition, folks! help stop the F train madness!